Kikuo Saito was born in Tokyo and moved to New York in 1966. Throughout the 1970s and 80s, Saito worked as a studio assistant for Helen Frankenthaler, Kenneth Noland, and Larry Poons. At the same time, he began his long career in the theater, doing set design, and writing and directing original works which combined wordless drama in the poetic framework of light, costume, music and dance. In later years Saito collaborated with Jerome Robbins, Peter Brook and Robert Wilson in both set design and production. 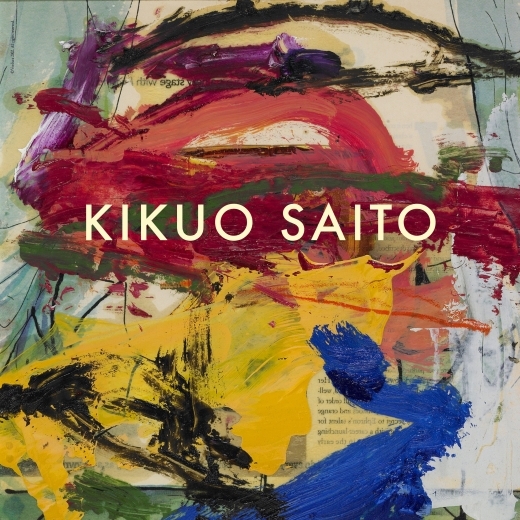 Saito has been exhibiting his paintings regularly since 1976 in the United States and in Europe. His paintings are in numerous private and public collections included the Museum of Modern Art, New York. As in his paintings, Saito’s works on paper integrate the painterly with the calligraphic. Saito paints on the floor, moving around the artwork as he creates it. He works in oil on different types of paper, which is sometimes torn from magazines, and interweaves rich painterly gestures over delicate washes. Occasional stenciled letters suggest an alternative way of looking, and provide a partially hidden grid for the unhindered abstract strokes. This show includes a full range of Saito’s work on paper, both in medium and in form: black oil paint mixed with wax; oil on paper and on magazine pages; and landscapes done from nature in watercolor. This is the first show devoted exclusively to his works on paper.